An interactive trailer for James Cameron's upcoming 3D opus Avatar has hit the web, which opens up the film to the power of social networks. 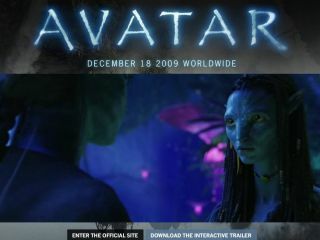 On the official Avatar site, you can either watch the trailer in the normal way or download an interactive version, which brings with it a whole host of new information about the film. When you download the Avatar app you are told: "This application gives you exclusive supplementary videos to the Avatar trailer. It also keeps you tapped into Avatar news and updates from Twitter, Flickr, and YouTube." To download the trailer, you must install Adobe Air but once you are all set up you can access the trailer through a desktop icon. Be warned, though, this is no ordinary trailer. You'll find that the promo pauses every so often to give you access to character profiles and other information, and there is also a continuous Twitter feed of the Official Avatar site which pipes through current information about the film. If you don't want an information overload, then stick to the ordinary promo. Other feeds that are available include information from YouTube and Flickr – both allowing access to the official pages for the film. There are also some rollover tabs available, where you can purchase tickets from a variety of online shops (all of which seem to be US-based). The interactivity of the trailer feels familiar to what you get with BD-Live, which is available on Profile 2.0 Blu-ray discs, and hints at what the eventual Blu-ray version of Avatar will bring. While this type of technology is still in its early stages - the trailer is the first of its kind built on Adobe Air software - it's certain to pave the way for more interactive trailers to come. Avatar has a release date of 18 December worldwide. To find out more, visit www.avatarmovie.com.